Rejecting Reality? Maybe You're Engaging in Cognitive Dissonance! Cognitive dissonance, is like double-think, and also similar to self-justification. It’s a form of reality negotiation, a process where we negotiate with reality to sustain our conformity to beliefs in falsity through the construction of illusions. We will often reject reality as it ‘is’ (new information), and instead opt to “feel-good” about ourselves by holding onto what we previously believed to be “true” (attachment to falsity or belief). We lie to ourselves, and create an illusion or false image of ourselves and reality. This is how many of us live, with a false self-view and self-concept. Rejecting reality promotes our counter-reality belief, or unreality. This is often used in order to justify and excuse our behavior as well, whereby we tell ourselves everything is right with the world and ourselves. This way, we can go back to “feeling-good” about ourselves and how we think things are, to feel secure and comfortable, and therefore no change is needed. Things can simply go on as they were before. 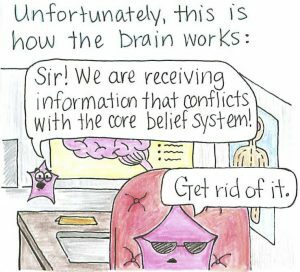 Here is a short 5-minute video that explains an aspect of cognitive dissonance. Please do more research on this topic, it’s important to understand in relation to how beliefs fool us because we want to believe they are “true”. Fooling and lying to ourselves is quite easy. We prefer a comfortable lie to an uncomfortable truth. We are often our own worst enemies! 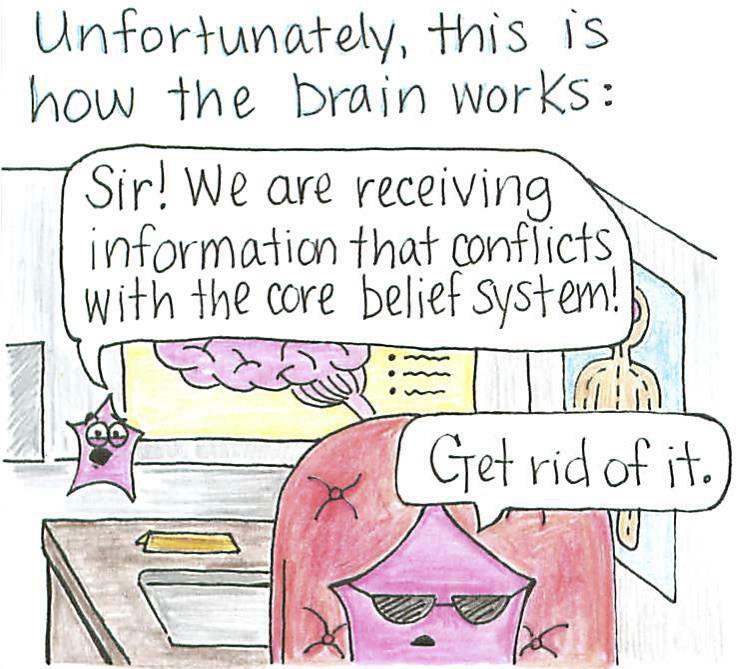 Beliefs often lull us into a false perception of reality because they “feel-good” to do so. Our erroneous self-views and worldviews can be maintained this way. We need to have more care, courage and will-power to face reality as it is, and drop many of our false beliefs that can be known to be such, and stop purporting others to be “truth”. Know the definition and meaning of words as they were created to reflect aspects of reality (etymology is a good place to start). Beliefs do not equate to truth. Truth in Latin is veritas, and it’s veracious, verifiable, and demonstrable. Feedback is welcome. Take care. Peace.